As acts of violence against women continue to rise in Guyana, so does the tolerance of it. This was found in a recent study by the Latin American Public Opinion Project (LAPOP). Founded over two decades ago, LAPOP is considered one of the world’s most reputable research institutes which specializes in the development and analysis of public opinion surveys. 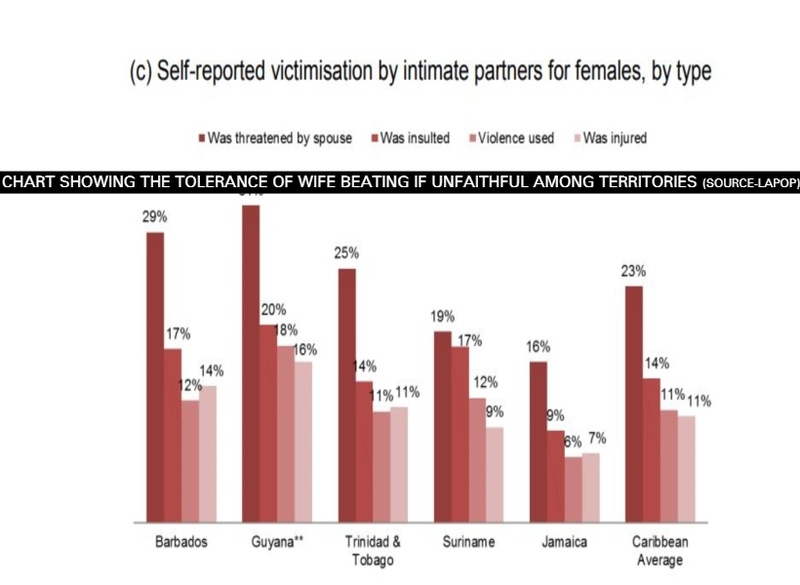 In its study on the social tolerance of violence, LAPOP found that tolerance of beating one’s wife if she is unfaithful is highest in Guyana when compared to other nations in the Americas. The statistics show that 48 percent of the populace would tolerate this behaviour. According to LAPOP, this reflects a 9 percent increase over 2016 figures. The report notes that this is an all-time for Guyana. Additionally, an examination of self-reported victimization by an intimate partner shows that Guyana has the highest rate among the Americas, for all categories regarding being threatened by a spouse (31 percent), insulted (20 percent), experienced violence (18 percent) or being injured (16 percent). LAPOP noted however that these percentages are still under-representative by far of actual prevalence, given that surveys by local authorities on crime do not take the extra steps needed to address the barriers to reporting intimate partner violence.